The MSGBC Basin has been the shining light of African exploration through the recent darkness the industry has endured. That light, or rather floodlight, was cast upon the region through the recent world-class discoveries in Senegal and Mauritania. TGS have been present in the basin since 2010, when they acquired a 3D dataset in The Gambia. 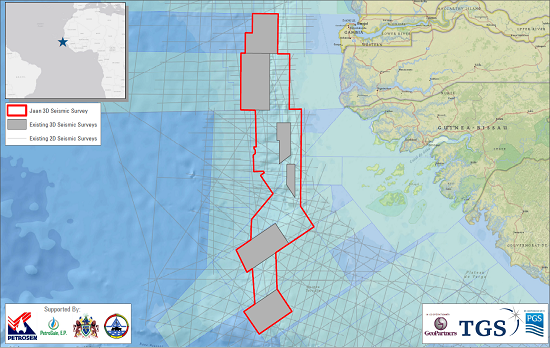 After seeing the structures in the subsurface, a commitment to acquiring a regional 2D seismic dataset over the MSGBC Basin on the North West African Atlantic Margin (NWAAM) was easy to make. During the recent industry downturn, TGS, with the geological knowledge and a strong balance sheet, acquired 3D assets from distressed partners, quickly taking a prime position along the palaeoshelf-edge trend, ready for future pursuit of the next SNE. Jaan is a fully harmonized 3D multi-client project in the southern portion of the MSGBC Basin from northern Senegal, through The Gambia and the AGC zone, into Guinea-Bissau down to the Guinea transform fault.